There is something that connects me to Ernest Hemingway, that is difficult to explain. He has a quiet way of portraying an emotional honesty that makes you fall in love with people. His characters, like all people... hide. But, he has a way of showing you what is hidden within themselves. That's what I love of people. They struggle through tremendous hardships, and a lot of the time cannot express what they feel... but there are times when some of it just leaks out. If you're perceptive enough, you can see it - and you can't help but be moved. Here's an excerpt... from a fat, old, uneducated woman about her not-stereotypically beautiful husband. This woman is someone you would walk by on the street and possibly not think anything of, or even be put off by her appearance (as one character is, later in the novel). "He went to sleep with the stump of his arm out wide on the pillow, and she lay for a long time looking at him. She could see his face in the street light through the window. I'm lucky, she was thinking. Those girls. They don't know what they'll get. I know what I've got and what I've had. I've been a lucky woman. Him saying like a loggerhead. I'm glad it was a arm and not a leg. I wouldn't like him to have lost a leg. Why'd he have to lose that arm? It's funny though, I don't mind it. Anything about him I don't mind. I've been a lucky woman. There ain't no other men like that. People ain't never tried them don't know. I've had plenty of them. I've been lucky to have him. Do you suppose those turtles feel like we do? Do you supposed all the time they feel like that? Or do you suppose it hurts the she? I think of the damndest things. Look at him, sleeping just like a baby. I better stay awake so as to call him. Christ, I could do that all night if a man was built that way. I'd like to do it and never sleep. Never, never, no, never. No, Never, never, never. Well, think of that, will you. Me at my age. I ain't old. He said I was still good. Forty-five ain't old. I'm two years older than him. Look at him sleep. Look at him asleep there like a kid." "You know I lay awake almost four hours just thinking about you." "I can think about you any time and get excited." "Well, we got to fill this gas now," Harry told her. Not sure if it comes across without the context, but the whole thought process of the woman really touched me. If you heard Harry's thoughts, they're different... but still of love. Anyway, I strongly suggest reading some Hemingway if you can. 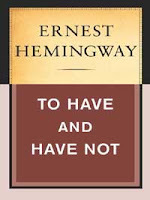 "To Have and Have Not" is a gem, although not widely known. For a widely known gem, read "For Whom the Bell Tolls." Pure beauty.